Thirty three people took advantage of a free Narcan training as provided by H.O.P.E of Phoenix and Syracuse Behavioral Health. PHOENIX, NY – Thirty-three members of the public are newly trained in Narcan administration for drug overdose situations after the H.O.P.E awareness group brought certified trainers from Syracuse Behavioral Health to the Phoenix community recently. Jason Page from Syracuse Behavioral Health presents Narcan training to 33 community members at the Sweet Memorial Building in Phoenix. H.O.P.E, Heroin Opioid Prevention Education, is an awareness support group based out of Phoenix that aims to bring educational, supportive, and recreational opportunities to members of the Phoenix and surrounding communities. “We plan to be a very present force in the community. There will be more opportunities for trainings and opportunities for fun events to keep the public busy because we all know the worst thing an addict can have is free time,” said H.O.P.E founder, Savannah Jaquay. Most recently, Jaquay and the H.O.P.E team brought certified trainers from Syracuse Behavioral Health to the Sweet Memorial Building in Phoenix to host an official training on Narcan administration. The training provided all the material necessary to understand Narcan, how to administer it and the effects of such medication on the brain during an overdose and afterward. 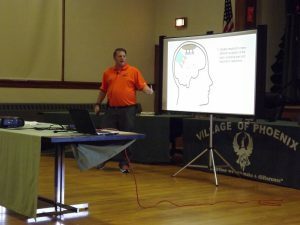 Guests of the training were also provided substantial information regarding the use of opiates and heroin, the physiological effects of drugs and addiction in the brain, symptoms of an overdose, risk factors for an overdose situation, the aftermath of Narcan administration and the public health laws surrounding an overdose situation. Page elaborated on the “Good Samaritan Law” that took effect in 2006 to protect non-medical persons that use Narcan in an overdose situation, comparing the use to that of en EpiPen for allergic reactions. Under this law, both the person experiencing the overdose as well as any person who notifies 911 and administers help are protected from law enforcement repercussions except for particular exclusions. This was created to help combat the fear of authorities in the case of an overdose to encourage help as opposed to any alternative, including possible death. Page explained to guests that Narcan can be used in any case with no adverse reactions and that whoever administers Narcan should call 911 either before or after administration, whichever is fastest in the situation at hand. Each guest was given a kit complete with two doses of Narcan to administer through nasal use or intramuscular. Page informed guests that any time after Narcan is administered, they should contact Syracuse Behavioral Health to compete a report and refill their Narcan kit. Thirty-three people took advantage of a free Narcan training as provided by H.O.P.E of Phoenix and Syracuse Behavioral Health. 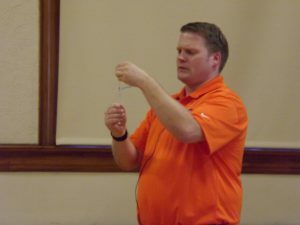 Thirty-three people were registered at the event to take home Narcan kits, according to Page and guests found the training to be understandable and enlightening in nature. “This is fabulous. The more people that know how to respond to an overdose, the better. To see everyone come from different ages, different backgrounds, and just come together with one common goal, is just beautiful to me,” Jaquay said. Nicholle Lippert also attended the training. In her career as a health educator, she’s aware of how predominant this growing issue has become, especially after losing a close friend to a heroin overdose. Angela Claflin took the training because addiction had become a regular occurrence in her family and after losing a close friend to an overdose as well, she had become familiar with the effects of overdose. This opportunity came from the H.O.P.E group with the intent to bring many more opportunities like it to the Phoenix community, an impact that does not go unnoticed by community members. “It’s a huge community impact (H.O.P.E) is having for prevention and bringing awareness of the problem, to not be blind to it any longer,” Lippert said. Jason Page of Syracuse Behavioral Health shows how to use both intramuscular or nasal administration of Narcan. Mayor Wood expressed a similar outlook. Jaquay encourages any and all community members to reach out and become part of the movement to combat this devastating epidemic. The group offers meetings open to anyone every third Thursday of the month and extends invitations to any member of the public for events such as Narcan trainings and upcoming recreational events. The next step remains the same, educate the public and prepare for more opportunities to do so, said Jaquay. “I’ve had friends and families ask what can they do to help and the one thing I can say is ‘Knowledge is Power.’ Power desperately needed to those who feel they have lost control due to addiction and its impact on themselves and the people around them. This Narcan training serves as a step to regaining that control. The best thing any one of us can do is start with education. It is a firm and strong foundation that enables us to build from the ground up,” she said.